If you’ve been to two webinars, chances are you’ve seen at least one that was not very engaging. I don’t mean to pick just on webinars – chances are if you’ve been to two conference presentations, you’ve seen one there too. However, most people won’t walk out of a boring conference presentation. In a webinar, participants can remain “in the virtual room” without actually being anywhere near the computer or presentation. As a webinar presenter, how do you ensure you don’t end up speaking to a ghost crowd? If you’re going to give a good webinar, you first need to make sure that you actually design your presentation for the webinar format (don’t plan to just do the same presentation that you normally run in person). You need to know what kinds of tools are usually available in the webinar platforms, and how to keep the audience engaged when you’re missing those facial cues you normally get from a live in-person audience. Presentation design is a whole other topic in itself (I taught a 9-hour course in digital presentation design last fall), but I can help a bit with the details of how to redesign for a webinar format and how to be prepared for all the details. I wrote an article for eLearn Magazine (just published today) called Tips for Effective Webinars. In it I go through a “Before, During, and After” set of tips for giving a good, effective, and engaging webinar. 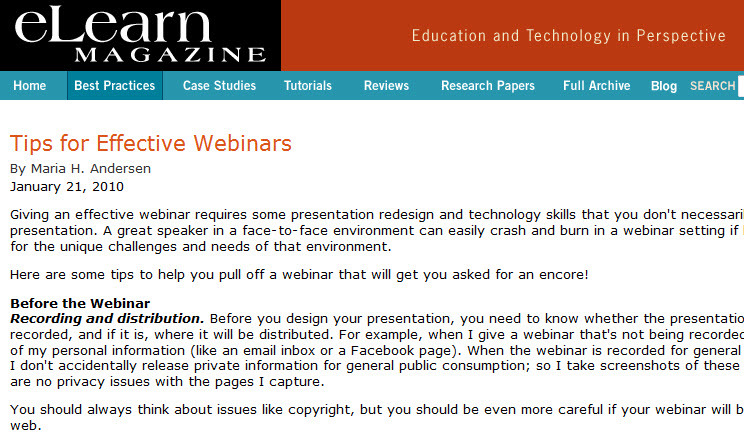 Head over to the full-text of the article Tips for Effective Webinars at eLearn Magazine. When I gave my first webinar, the folks at the UW Extension office were nice enough to give me some training and advice, but not every new webinar presenter gets that. So please, forward the article to anyone you know that could use a little training on how to give an effective webinar.